I'm overwhelmed. The wedding was so beautiful and there were so many little things I want to chat about, I can't even collect my thoughts. I guess that's not all that weird for me, but this morning is particularly scatterbrained in my world. It could be the tiny amount of sleep I got. No matter, I'm running on the caffeine of prince and princess love. I'm drunk on romance. Stoned on fairytale endings. Cracked out on the grandeur. She looked stunning. It was simple, but intricate. Modern, but traditional. Impeccable. The winning designer was Sara Burton of the late Alexander McQueen's house. WOW. I must say, long lacy sleeves were kind of jarring to me. You don't see that much these days, but she had to be covered for the ceremony. I kept thinking of Madonna actually. That may or may not be a compliment....loved. As soon as we first saw him you could tell he was totally freaking out. See awkward thumb twiddling above. GIANT SWOON. But really, WTF is that cartoonish thing? After that hat, she may be banned (like her mother) from these dignified affairs. My mom texted me bright and early about this one...and shares my sentiment that this thing is truly heinous. She is still a princess, so she'll always beat me, even with strange things on her head. Pout. Sidenote: Doesn't it look like William is having some sort of intestinal chaos here? Giggle. This is my new favorite ginger. And I love lots of them. He was so stinking cute. He was such a sweet best man. So smiley. He was also kind of a pistol. He was smirky and whispery and winking at random people in the crowd. He's a charmer. Those types always seduce me. There's nothing really new here...he looked so. freaking. hot. UGH. I love that tux. Love the medal. Love the tophat. UGH. He just exudes perfection. Posh doesn't look to shabby either. She did kind of wear stripper shoes to a wedding, but hey, she's tiny. Love. What'd you think was pretty? Anything ugly? Anyway, that's all for now. The continuation of this post, the more lovey, dovey stuff, is headed your way! I thought the EXACT same thing about that giant "O" bow on the top of Fergie, The Sequel's head. WTF? But the whole thing was just so spectacular, so sweet, so.... perfect. I loved that Kate was obviously nervous when she got out of the car with her father. I loved that Wills seemed to calm her and joke a little bit. I loved watching Harry and had the same thought of "where's the booze." I see a keg-stand in his future. Did you see when they left Buckingham and drove themselves to Clarence House in a convertible Aston Martin? Awesome. btw - the word verification on the above post was "scroting." Did you have something to do about that? Made me giggle. You will have to fight me for Harry! I loved how he was goofing with the kids in the carriage. And he was reassuring Wills before the ceremony. Great brother and best man. Her dress was stunning! And absolutely timeless. 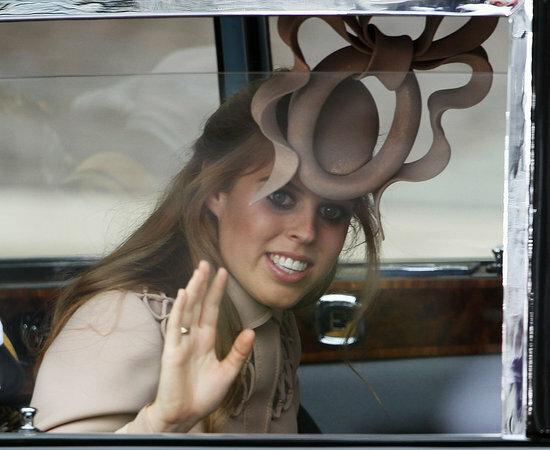 And the Princess' hat is ridiculous! I posted about that too. 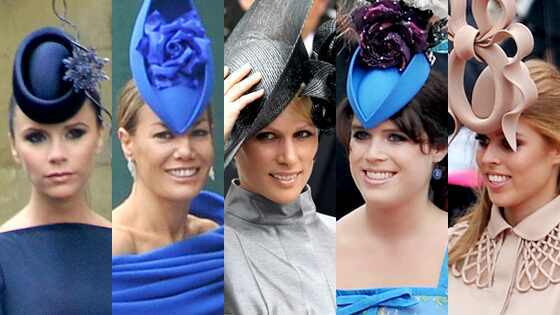 Seriously that hat, what the heck was she thinking? Posh is super pregnant too - I think she looked pretty friggin awesome regardless. Harry is a total babe - with some serious edge to him. If there was one thing I had to say that I didn't like, it was her bouquet. A minor detail, but I thought the flowers and arrangement were very dull compared to the rest of the event. All in all, magical! Oh and men in uniform. Yes. Please.